The practice of making lei is tightly woven into the fabric of Hawaiian culture. 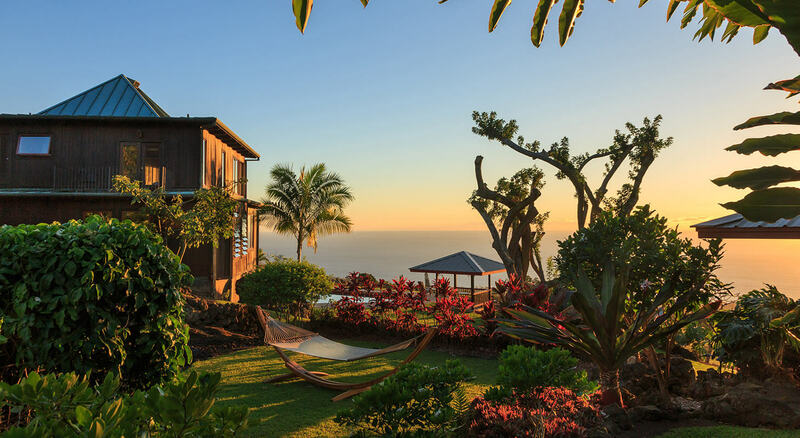 One thing that is certain about lei is they have been made and presented to others since the arrival of the first Polynesian settlers to the Hawaiian Islands over 1,200 years ago. 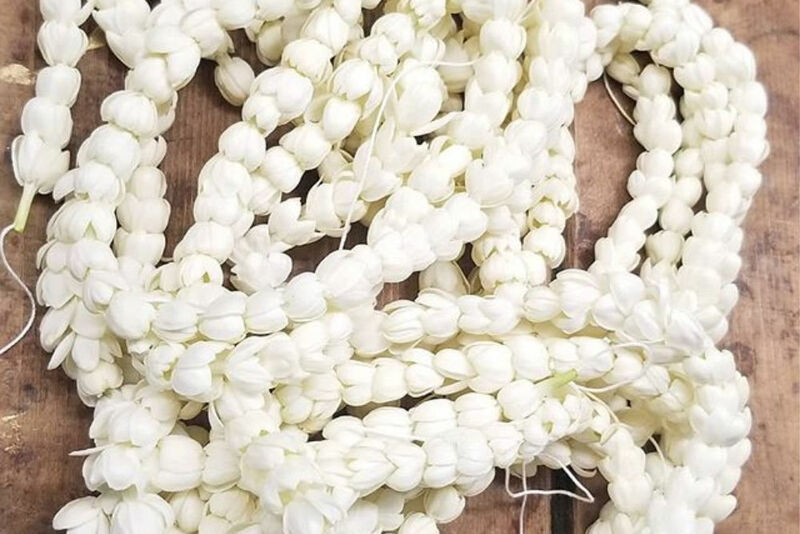 Beyond this fact, the history of lei­-making is wrapped up in legend and folklore, and the meaning, use, and customs surrounding lei have evolved over time. At the most basic level, lei are given to honor or decorate another person, or as a sign of affection. Early lei in Hawaii were very similar to those crafted on the other islands of Polynesia, but over time the styles of lei evolved and multiplied, reflecting the abundance of new materials that were available to the Hawaiian settlers. With the development of a power structure defined by a rigid class system, certain lei in Hawaii became symbols of status. The kukui nut lei, made from the polished black nuts of the candlenut tree, was worn only by the ali’i, members of the royal class. It was considered kapu, or forbidden, for anyone else to wear this particular style of lei. But with the dissolution of the kapu system in 1820, the significance of the kukui nut lei was lost. Today the kukui nut lei is one of the more popular styles of lei worn in Hawaii, particularly by men. A well-crafted kukui nut lei is striking and is much more durable than any flower lei. The customs surrounding lei have evolved over time as well. Traditionally, when a lei was presented it was held up as an offering above the heart while bowing slightly. It would have been considered offensive to hold one’s arms above another person’s head or to touch their head with any object. The first modern presentation of a lei is at least part folklore. It is said that when U.S. soldiers arrived in Hawaii during World War II, a young woman threw a lei over a soldier’s head and gave him a kiss on the cheek. Thus was the modern tradition of lei­-giving born. In the early 1900s, steamship visitors to Hawaii were presented with lei upon their arrival. The lei was considered good luck and were kept until it was time to set sail again. Then the lei was tossed from the ship into the ocean, in the hopes that the wearer would one day get to return to the islands. Today lei are no longer thrown into the ocean for ecological reasons, and a more traditional custom has regained popularity. 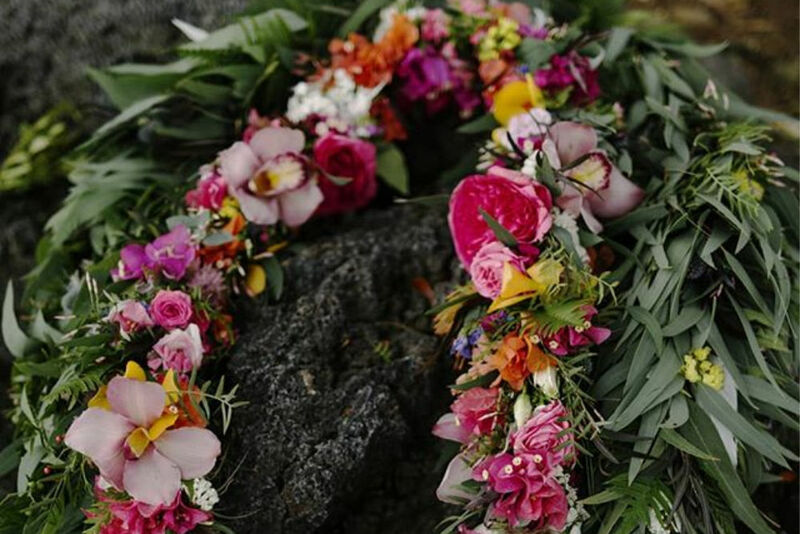 A lei should never be removed in front of the person who presented it, and it should be kept for as long as possible. Flower lei can be dried on a windowsill to fill a room with fragrance. When it is time to dispose of a lei, it should either be returned to the tree from which the flowers were plucked, hung up from another tree, or burned. One thing that is certain about lei is that they are just as ubiquitous today as they have been throughout Hawaiian history. Lei is still used to welcome visitors to the islands, to decorate hula dancers during performances, or to honor graduates from high schools around the islands. They are used in Hawaiian wedding ceremonies in addition to rings to symbolize the union of two people, and they adorn statues throughout the islands on Kamehameha Day, Prince Kuhio Day, Lei Day, and more. Flower Lei – Most commonly made from fragrant Plumeria blossoms, flower lei are often given to visitors to the islands. Flower lei can also be made from hibiscus, jade, gardenia, or any of the other tropical flowers that grow in Hawaii. Special flower lei made from the lehua blossoms of the ohia tree were traditionally used to decorate hula dancers at the Merrie Monarch Festival. Leaf Lei – Lei can also be made from braided leaves. 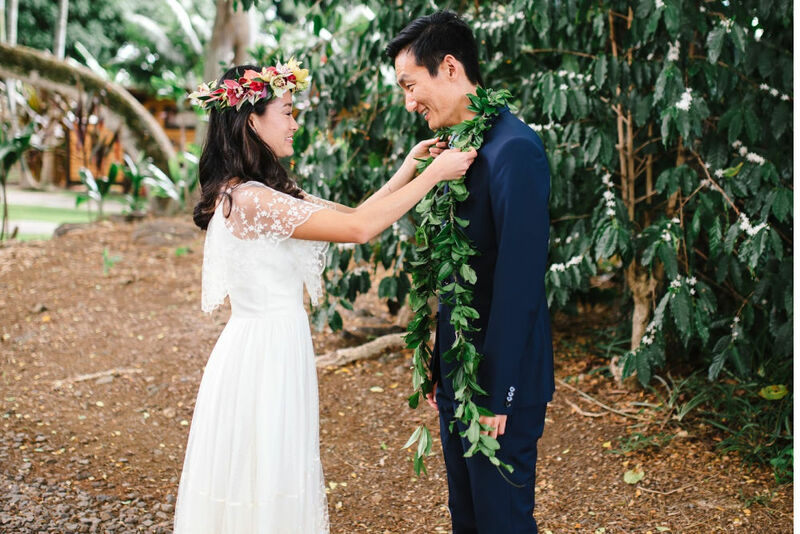 The maile lei used to adorn the groom during a wedding is a notable example, but simple lei can also be made from braided ti leaves. 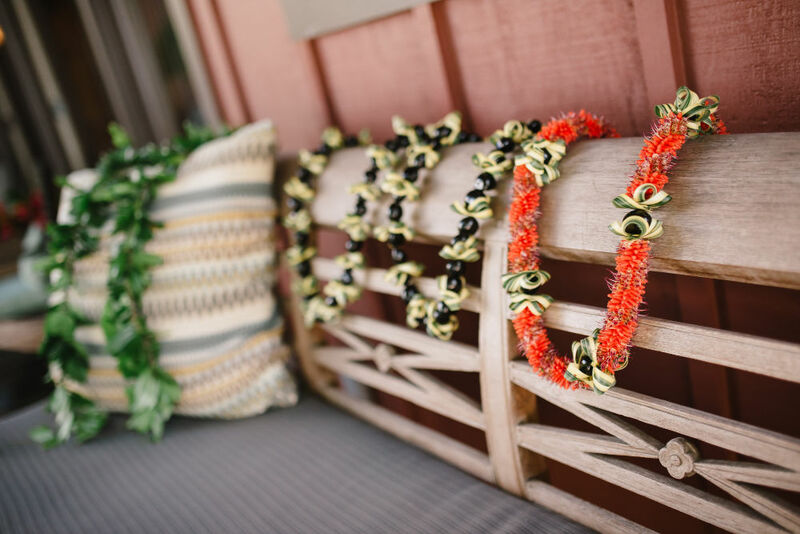 Shell Lei – The rarest and most prized lei are finely crafted from tiny shells from the forbidden island of Ni’ihau. Bone Lei – Ancient lei were crafted from whale bones, and more modern examples are crafted from the tusks of wild boars. Lei Po’o – Lei can also be used to adorn the head. Hula dancers typically wear these lei during the Merrie Monarch Festival. 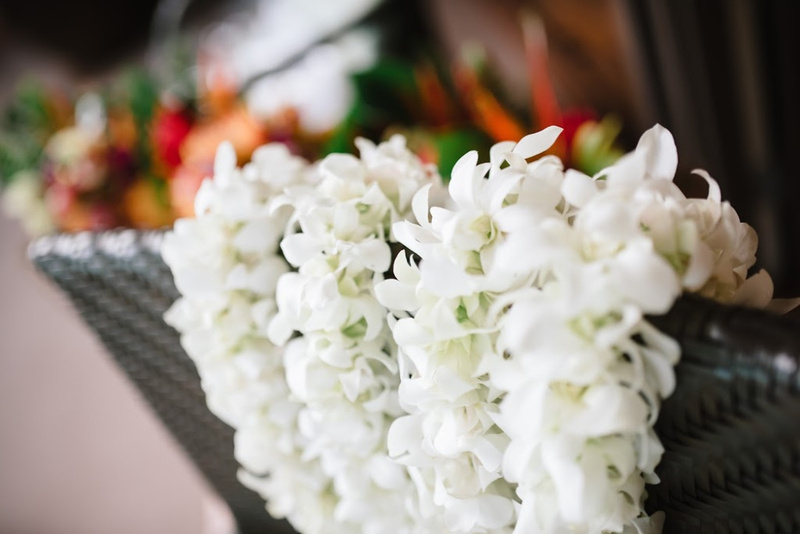 Lei greetings are available upon your arrival to the Holualoa Inn, and they are provided with all of our Elopement Packages. If you would like to have a hands-on experience making lei, please let us know and we would be happy to arrange a class for you. Learning to make basic lei is easy and fun, and is something you can bring home with you to share with your loved ones.